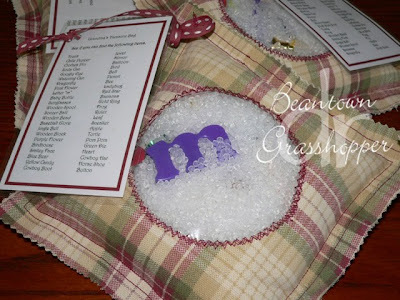 When we were stationed in Virginia, I learned how to make these bags. They are really easy to make and a lot of fun. I made one and then on of my daughters had sewing 101 helping me with the other two bags a couple of days before we left on our trip. We took one of them to Massachusetts to give to my cousin's kids. Their kids (7 & 5) really liked it. These bags are super easy to make. They get a little spendy with all of the things you put inside and the beads but they last so long. When I first made one, my kids would sit and try and find things, their friends liked it when they came over and were waiting. It went in the car with us and even to some dr. appointments. As many things as you want to fill it with. 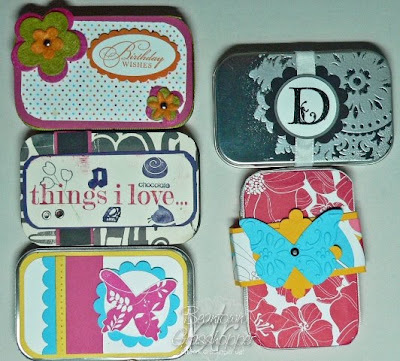 I forgot to share the tins from the Altoid tin swap I participated in last month. 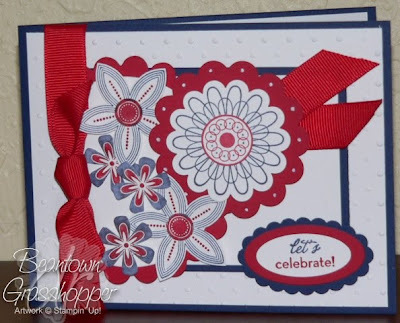 I never thought of embossing on it but the Medallion stamp is awesome for it. I like the personalization with the initial too. I was looking for some inspiration and thumbed through the current issue of Paper Crafts. I came across a card similar to this one. The card in the magazine has caught my eye every time I see it. I can't say it was a favorite because I didn't dog ear the page. This time, I decided to make it using a similar stamp. My e-mails have been piling up lately as I've been busy with other things. Sometimes it is so busy that it doesn't feel like summer and then there are the days that are laid back and it is what summer is all about. Getting together with friends, going to the beach, reading, etc. I spent a couple of hours going through SOME e-mails the other day and saw this from Vicky. I loved it. So simple. So elegant. I had to make it. Of course, I didn't have the right color of textured cardstock so I went with the plain version. I didn't want to get up to get the Melon Mambo ribbon, so I went with the Razzleberry on my desk. I can't wait to go through the blogs when I get home from camp. I'm sure there are some fabulous ideas being shared. You should have arrived here from Lori's blog, Paper Castles. 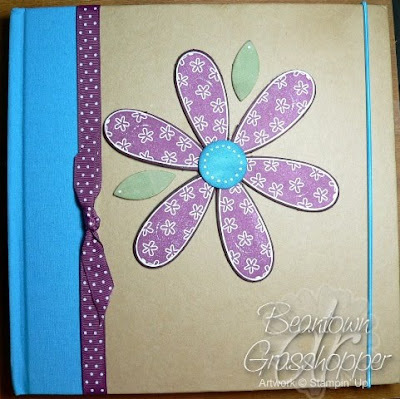 The file folder notebook that she shared is pretty snazzy. 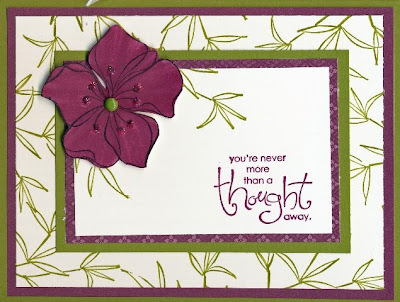 I have had that project on my "stamping to do" list for a while. Her card sets in different colors are nice too.When I saw the Bigz Island Floral in the catalog, I could only see a Christmas light bulb. 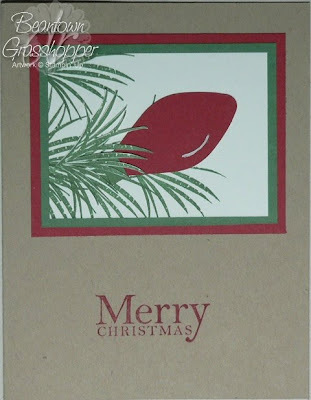 Today I give you Christmas in July.Stamps: Tropical Party, All HolidaysCS: WW, Garden Green, Riding Hood Red, Crumb CakeInk: Garden Green, Riding Hood RedMisc. : Bigz Island Floral, White Signo PenThanks for stopping by. Your last stop is Loni Holt. Enjoy! One of my girls is off to camp tomorrow. They were asked to bring 3 small gifts totaling $5 (or free). We went shopping yesterday and she picked up a $1 lip gloss, a bottle of bubbles on clearance for $2.87 and a bottle of nail polish. We never did find out how much the nail polish was, and it is safe to say that we exceeded the $5. This notebook is her third gift. She is combining the bubbles and lip gloss. We are considering this notebook "free" since we didn't buy it, we already had it and the supplies. I got the notebook from Target a couple of years ago. It was either on sale or clearance. I just remember being excited about the price and I picked different sizes up with black, pink or turquoise colors. Have you read any good books lately? I'm reading The Good Earth and should finish it tonight. I hope the main character rethinks something he has done and goes back to the down-to-earth person he was instead of being so prideful. His values have changed and it is sad for him, his family, and others that are affected by his choices. I'm appreciating how swiftly this book moves along and yet, the point is made.I'm on a bookmark kick again. I'm making some for friends and for the girls at church for one of our meetings when we have a book review. I'm looking forward to hearing their top picks and a little of their book of choice.One of my daughters needs to have several gifts this week that total $5 or are free. I was thinking a couple of bookmarks would be good, along with a notebook that is jazzed up. She is thinking lip gloss or something similar too. We are going shopping tomorrow to see what we can find. 1. On the Wild Wasabi card base, stamp the leaves across the middle. 3. Pierce the Marina Mist cardstock (1/2" x 5-1/2") and attach to the Espresso CS with adhesive. 4. 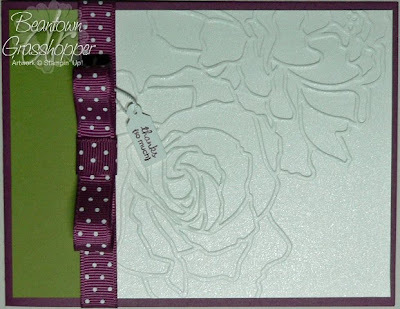 Tie the ribbon around one end and mount to card base. 6. 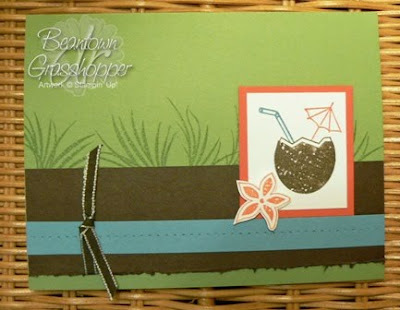 Mount coconut/tangerine on the card. 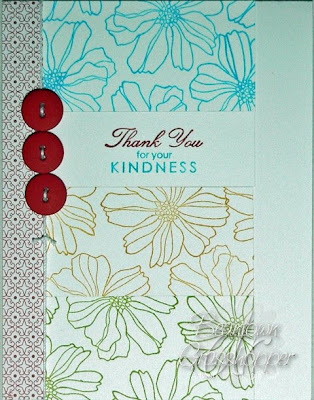 I used Punched Posies a lot this past weekend and found it to be a fun set to use. When I first saw it, I wasn't that thrilled with it and thought it would be somewhat limiting, dang was I wrong. This is one of the few things I don't mind being wrong about. 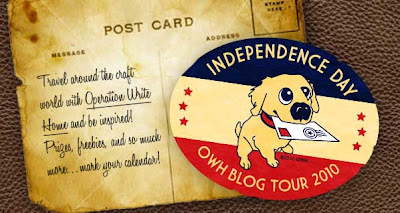 Don't forget to check out the OWH blog for the tour. I hope everyone has a great Independence Day celebration. 1. The base of the card is made with Crumb Cake. I cut a piece of crumb cake 3" x 4-1/4" to run through the Big Shot with the texture plate and then sponged. I've received a couple of RAKs and a RAK back in the past week. 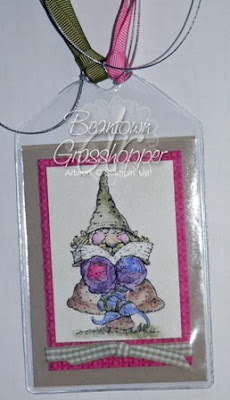 One card I shared previously from a swap I was in. It is always nice to get happy mail. Sue-Lynn BockGina TaylorPatrice HerreraToday I get to go back to my stamp room. The day camp I did is over and went over well with all of the girls that attended. A lot of work but totally worth it.